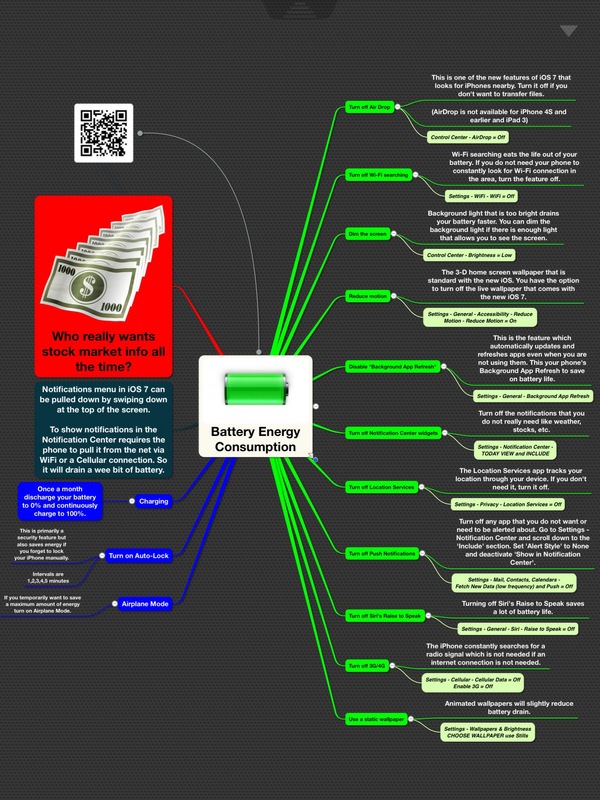 Mind mapping is a widely used powerful technique to visualize information. If you look on a mind map you see that one central topic is connected to subtopics with an underlying hierarchical structure. Scientific studies validate that mind mapping improves learning, understanding, planning, and with it the development of personality and knowledge. See this study from a company developing the mind mapping tool iMindMap founded by Toni Buzan who is seen as the rainmaker in modern mind mapping. 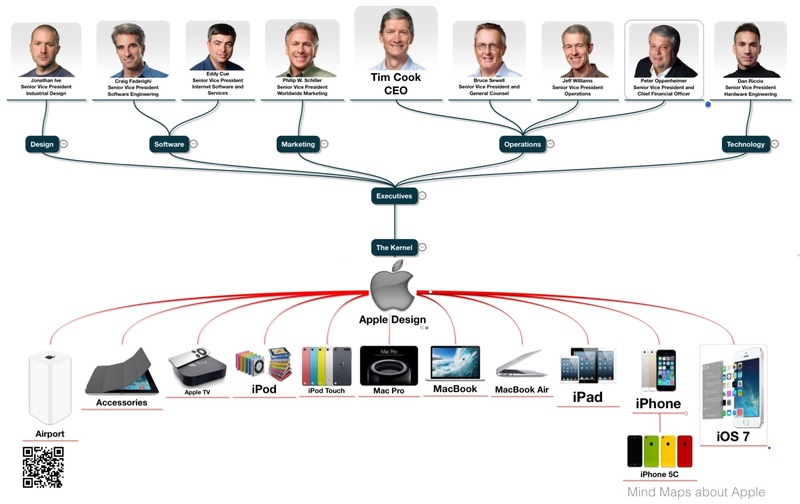 What’s the relation between Apple and Mind Mapping? It’s the iPad which allows to be creative everytime, everywhere, and without any peripherals just using your brain and your fingers. This device initiated a shift in paradigm of learning, teaching, and improving knowledge and personality. 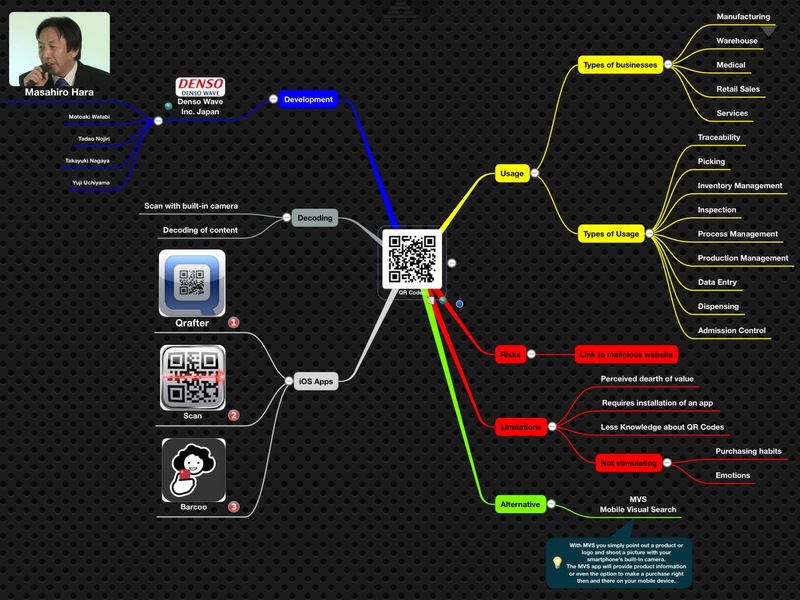 Mind maps can summarize important information about developments like the fingerprint scanner, the companies strategy, philosophy, advertisement, the usage of it’s devices, suggestions for purchasing products from Apple’s stores, and last but not least feature descriptions of apps running on iOS devices. Even a SWOT-Analysis (Strengths, Weaknesses, Opportunities, Threats) can be presented as a summarization of all known parameters affecting the companies position in the market. All this can also be done by textual descriptions but scientists validated that a mind map is always more intuitive to understand and is kept in mind for a longer period. It’s a shame that Apple, seen as the most innovative company in the world, ignores the mind mapping technique like all other companies. 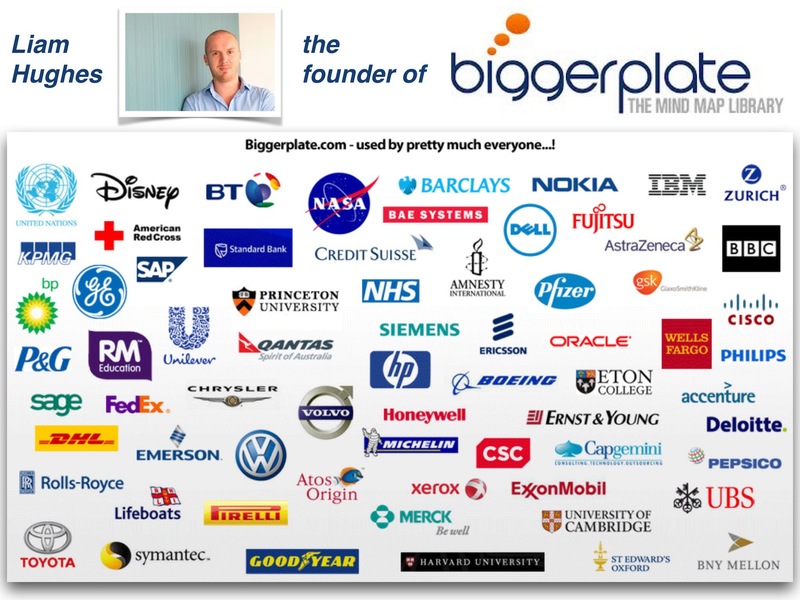 Liam Hughes, UK, founded the now biggest platform for mind maps with more than 60k members worldwide. The free registration allows you to download more than 500k maps and upload your own creations. One of the groups you might me interested in is the Apple group with maps about ‘All things Apple’. I created this group in January 2013 and it now contains about 80 maps. Go to biggerplate.com, register (it’s complete free), select Groups from the navigation bar, then select ‘Apple’ and join the group. 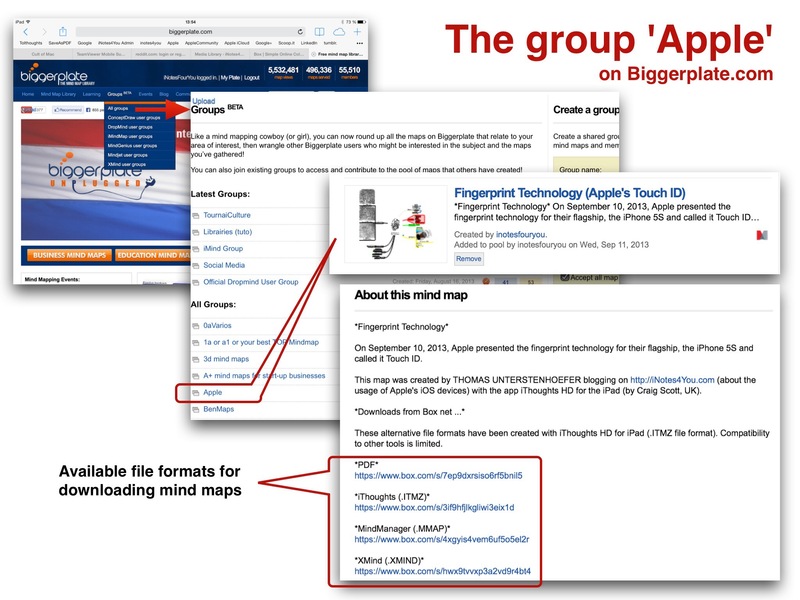 If you choose the group Apple you will find mind maps with a description and alternative file formats for downloads. Because of the many existing file formats of the different tools I added a special service for those who don’t use a mind mapping tool or those who use an other tool than iThoughts for the iPad. You will find the download links for each map in the section ‘Description’. The alternate file formats were created with iThoughts and it’s possible that some minor compatibility issues occur. Here is a brief description how to use the Biggerplate platform for maps related to Apple. The creation of my maps is always done with the app iThoughts HD for the iPad by Craig Scott, UK. iThoughts is perfectly adapted to tablets and so Craig talks about ‘Touchy feely mind mapping’ when it comes to use the technique on Apple’s mobiles. 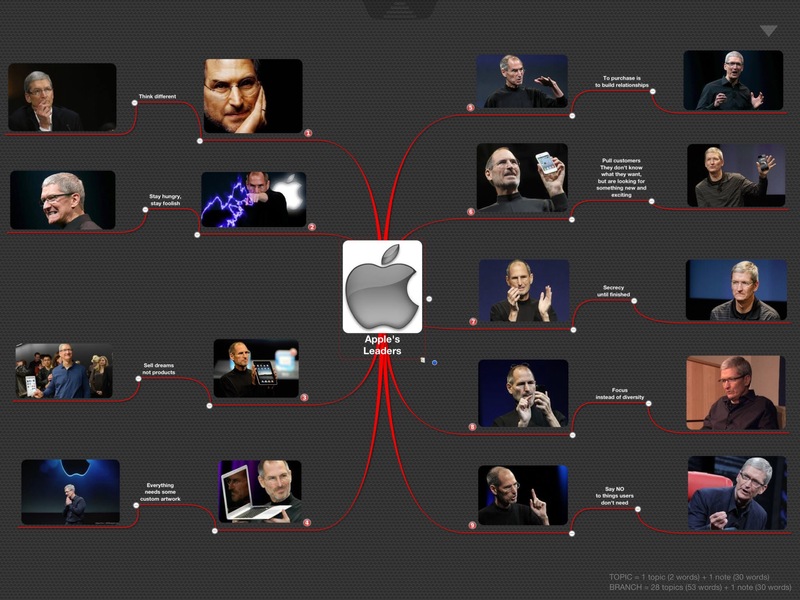 Here are some examples for Apple related mind maps. When going to Biggerplate com you can download all these maps and more in different file formats. You can also get more information here on my blog by tapping on ‘Mind Mapping’ in the keyword cloud.